Kevin is our new Operations Manager, responsible for scheduling of the production floor, engineering of new projects and running the day to day operations of the plant. 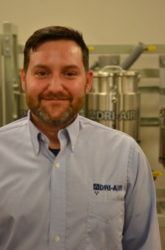 He comes to us from Meredith Springfield in Ludlow, MA where he was responsible for managing a three shift blow molding operation. His expertise is a great asset to the flow and output on our production floor – especially with the newly added space from our recent addition. Kevin resides in Windsor, CT with his wife and three children and attended UCONN’s mechanical engineering school.